Conventions Coming Up in Indy this Year! What do we have coming up this week!? This year is looking brighter and brighter everyday! We have amazing local Conventions coming up this year including Indiana Toy and Comic Expo headed up by Billy Cooper on July 20th. We have the Indiana Comic Con making a name for itself everyday with announcements and vendors galore. It makes its way to town March 14 – 16. And last but not least we have friend of the Blog Chase and his crew with the Indy Pop Con from May 30th to June 1st of this year. That is very big for collectors, Nerds, and the City of Indianapolis. Indiana Toy and Comic Expo will have vendor’s, local artists, and a wide array of collectors from far and wide that will make the event a great way to meet new people, collaborate with local Nerds, and possible make lifelong friendships that will transcend the event itself with Toys, comics, and much more. Indy Comic Con will no doubtedly be a huge event for the city and being at the Convention Center will drive a lot of business into the Center and make it s great chance to bring even more events to Indy. With many Artists, Vendors, Actors, and more it will none the less be the biggest event we see in Indy except for the GenCon. Indy Pop Con is this startup Convention that has gained so much steam that no one except for maybe Chase Kahlo even saw it gain so much ground so fast. With the help from their Kickstarter Indy Pop Con has announced some huge guests and events for the 3 day show at the end of May. So If you plan on going to some conventions this year. These 3 are local and going o be awesome, you should go to them and you’ll see why Indianapolis is the best place on Earth for Nerds and Conventions. Some very big News coming from Nerd Management this week. So check out their website http://www.Nerdmgmt.com and go to their Twitter and Facebook Pages here as well. 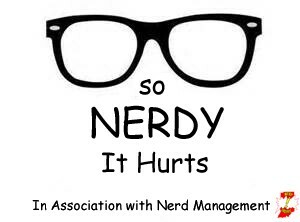 As you may know my association with Nerd Management took a step forward with this blog being featured on the Nerd Management website from now on. So if you find yourself without anything to read, or listen to stop on over to iTunes and subscribe to the Nerd Management Podcast and swing on by Comic Book University on the Southside of Indianapolis for all of your Graphic Novel and Comic needs. Moon Knight and Beta Ray Bill to Star on STARZ? Moon Knight and Beta Ray Bill to the Big Screen? Marvel has already made a fortune for Disney by creating a world for TV and Movies from their cache of Superheroes and villians. Moon Knight and Beta Ray Bill could soon make the transition sources from Marvel have let slip either they will be part of Phase 3 or a part of the Netfilx tv franchises. With Warren Ellis penning the new Moon Knight series for Marvel in the upcoming Months and with Beta Ray Bill poised to be a regular in Guardians of the Galaxy and Inhuman books for Marvel will we see them in the small or big screens as they are inundated into the front of Marvel’s new style of blitz krieg story telling? Ellis recently told Comic Book Resources, “Moon Knight investigates the strange and dark corners of the Marvel Universe, and boy, there are weird things there.” He’s right. But is playing to the zeitgeist enough to make the character more than just another minor comic book property? After all, Ellis hasn’t said he wants to write a Moon Knight TV or movie script. With Moon Knight fighting Werewolves, Vampires, and other Creatures-of-the-Night if it goes to the Big Screen look for a 3 picture deal, or if it goes to the small screen look for it to be very intense. With the new deal Marvel and Disney has made with Netflix to put shows on and with the pressure that DC has put onto the industry with shows on major channels. It looks as if Amazon Video, FX, and Starz is getting into the Superhero game by placing bids on TV properties from DC and Marvel. Marvel Mash Up’s: What Were They Thinking!? Marvel Mash Up’s: What Are They Thinking!? No one wants to buy these! Sorry starting out like that isn’t how I wanted this to start, but what in the name of everything are they thinking? Why waste man power, time, and money on something that is almost a direct-to-clearance toy. A shelf rotter to say the least. No one wants to build-a-figure if it isn’t a Legend or Marvel Universe figure. Legendary Comic Book Heroes toy line proved that. Only a small bit of us collected those. I would have thought Marvel and Hasbro would have learned their lesson when the Iron Man 3 build-an-Iron Man sat on the shelves and never sold. But it seems as if they are allergic to sales feedback or the complaints of toy buyers. I know they only fueling these still being made is a Grandparent factor. Grandparents see these on the shelves and think their grandchildren will want them. So the small sales that they are making are stocking stuffers and birthday gifts from Grandma Gabby and Papaw Pete. Collectors don’t want these and no real kids want these either. So the delusion of Hasbro is basically blinding. DC doesn’t come out with many toys but at least the ones they do are somewhat thoughtful of collectors and kids. Marvel and Hasbro seem to have a bet to see who can think of the most absurd toys to sell and then they vote for the crappiest. Why not put better toys out and not worry about legends size mix-em-ups with cartoon like looks. Its mind boggling and I SMH every time I walk by these in the stores. Please if you see these and you think you may want them to even keep them in the box and display please dont we have to show Hasbro not to do these stupid things. Maybe then they will be a little more thorough with their toylines from now on.